I played drums with the Strangers back in the Sixties at the Floral Hall, Goodes Hotel Gari, and many other Venues. This page was added by Bron Parker on 18/09/2012. Thanks for your comment; I still see Peter and John Taylor who played with us as well as the Ramblers. Rod Harvey our singer is still about but not too well, keep in touch. Hi, I'm still around, still playing mostly in jazz combos these days. The NJP Trio is my regular band with John Temple (sax), and Stuart Gooch (bass) - although we still do the occasional revival gig with whoever is still standing. The next one is Friday 18th October at the Kingfisher at Burgh Castle, to raise money for a hospital charity. Looking forward to seeing the TV film with Bron later in the year. Keep in touch. Hi, You might also be interested to see the article by Joseph Harlow that has just been published on this site in the Leisure section. Its me again, I have started Jamming with a sax player, keyboards and bass at Henstead craft centre - look at their webpage for dates. and I have just viewed your old posters so maybe that answers my question about Les Merry? This latest picture of the Mi££ionaires was kindly contributed by Steve Dunn. My name is Eddie Page and I am a drummer living in Berkshire. I am writing my second memoir of my time as a musician in the 1960s. I played in a band named Platform Six. We were also the backing band for girl singer Billie Davis. She had a hit with 'Tell Him' and she also had a well publicised affair with Jet Harris etc. 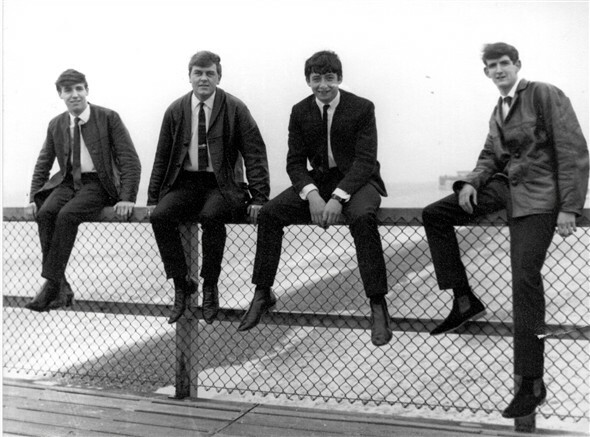 We did a series of Sunday gigs around the seaside resorts; Torquay, Morecombe, Brighton, Isle of Man etc including Great Yarmouth on September 5th 1965. 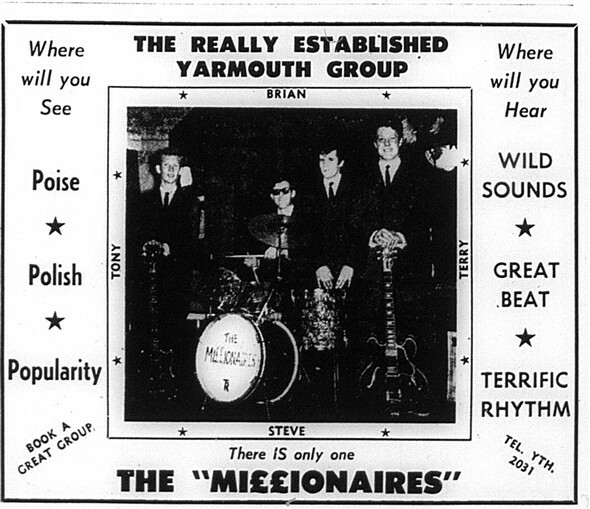 I can't remember the name of the theatre and I possibly have the wrong date but we did play Great Yarmouth during that 1965 summer. It has been suggested that the most likely venue is the Aquarium or Royal Aquarium. I notice from your excellent website that residents are contributing comments as to the acts in the sixties. In response to the question regarding Great Yarmouth's Royal Aquarium. The main part of The Royal Aquarium complex was a theatre where many well known stars appeared in summer season shows throughout the years. These days it is a cinema and has been for many years. The rear of the Royal Aquarium complex was mainly a live entertainment venue which has undergone several name changes over the years which are as follows The Dixieland Showbar, Stars & Garters, Rosie O' Grady's and The Residence. These days the venue has exceeded all expectations in more ways than one and reached new depths in which the venue has now become a lap dancing club for goodtime gals. And they say progress is a wonderful thing. As a drummer myself who played professionally for many years you might find some other interesting information in some of my own articles on this Our Great Yarmouth website in the dancing section titled Band Memories A Drummers Journey and Early days with The Cumberland Gap Trio. Another article in the theatre section also titled Band Memories was originally published by our local Great Yarmouth Mercury in 2009 under the original title If It Ain't Got That Swing about my life on the road. Here you will also find a photograph of myself backing singer Ronnie Carroll in the 1980's. Hope you find this information useful eddie. If you want any more information feel free to leave a message at the end of any of my articles on this website. All the best with the memoir have a nice life and keep swinging. hello everybody,does any one know what happened to tony collier bass player with the millionaires ?, i worked with him in the 60s at h a holmes gorleston, where he made his first guitar. very fond memories.